Note: Occasionally Proxiblog will post “On the Block,” allowing auctioneers to speak their minds about selling coins online. We begin with Chris Fisher, owner of Fisher’s Auction and Appraisal in Edgewater, Florida. I truly believe that the overwhelming percentage of buyers and sellers are good and decent people. As with any other endeavor, there is a small percentage of people who really make you think about conducting another online auction. We have had a few issues over the years. Most are due to people not understanding the processes behind selling via an online venue such as Proxibid, and a small but seemingly increasing percentage of people who are engaging in out-and-out fraud. I really don’t have that many issues with the coins that I sell. The reason for this is that I have a person who is very knowledgeable doing our catalogs and can describe the coins for me. It may cost a few hundred dollars per auction, but it is worth it. One of the biggest costs involved in conducting online auctions is credit card fees. I am a little guy and it still cost me over $1000 – $2000 every month in fees just from online bidders. Unpaid merchandise usually accounts for another $300 to $1000. It might not seem like a lot of money to a lot of people but it means a lot to us. Online bidders are very important to us. We truly appreciate every legitimate bidder that signs up for our auctions. Please note that most of these problems occur because of a very small percentage of bidders just don’t realize what is going on, not because they are intentionally trying to cause problems. 1. Please provide us with valid contact info. If you are like me and are rarely home, please provide another contact phone number. 2. I am a bidder at other auctioneers online auctions. I really do understand what it means to be a bidder. I understand that it is easier to keep a bidder than it is to buy a new one. I will do everything within reason to treat you right. I will attempt to ship your items in the most cost effective manner. 3. Online bidding has a lot of variables. Just because you left a maximum pre-bid of $100 and another bidder got it does not mean that we are trying to give you the shaft. The computer may have had you at $95 and the next bid would be $100. We would not under any circumstances bump your bid to $100. You have just came in on the “Back Side of the Bidding”. There is nothing we can do about it. We are sorry but it does happen. 4. Why do we charge 17% for online bidding? Our normal buyers fee is 10% to our house bidders. Proxibid charges us 5% for everything that is sold to online bidders. Our credit card processors charge us significantly more of a percentage when we do not swipe the credit cards and type them in manually. The extra 2% does not cover the complete cost, but it does offset it for the most part. 5. If you use a spam blocker please add us to your safe senders list so that we can contact you via email. 6. If you have a question about an item, please contact us before you bid. Most auctioneers love talking to potential bidders and we don’t mind answering your questions before the auction. You questions actually help us to learn more about our items and allow us to serve you better. 7. Please do not ask us to circumvent Proxibid and let you do a phone bid on a $50 item just so you can save $3.50 in buyers fees. Also, if you ask us to call you for a phone bid, please have a realistic idea as to the value of a particular item. While it is remotely possible, it is highly unlikely that you are going to win an item with a legitimate value of $20,000 for $1,000 at a properly promoted auction. Please make realistic starting bids. 8. We have no control over internet speed or service availability. One of the downsides to bidding online is that you the bidder must have done your homework before the auction. It is important that you have an idea of what you are willing to pay for an item. We move quickly at our auctions selling an item on the average every 30-45 seconds. If you (or us, or anywhere in between) has a slow connection, you will lose the item. It moves just as quickly in the gallery. 9. Most auctioneers DO NOT give preference to the in house bidders. Most of us are die hard capitalists and we try to give preference to the person who is willing to pay the most for a given item. I do not care if you are in my gallery or online. Please do not call me screaming about me missing your online bid. Please refer to number 6 above. 10. Believe it or not, our in house bidders feel as though the online bidders have an advantage over them. They feel as though they have to pay 6.5% sales tax that you do not have to pay, plus they take the time and expense to drive to the auction. We have regular bidders who will not attend an auction that we conduct online because of the unfair advantage you possess in their eyes. Now for the things that don’t happen often, but drive us nuts. 1. People whose credit cards are no good. We really do not like chasing our money. Proxibid only allows us a few days to report non-paying bidders. I used to just eat these bad debts, but after getting nailed by more than a few of these people I do not hesitate to report them to Proxibid. If this means that they cannot bid at another auction, I am sorry. 2. People who do not read the terms and conditions or feel as they don’t pertain to them. When we say that we do not accept checks, we really mean it. For us the reason is that in most of our contracts with our sellers we MUST pay them within 7 days after the auction. If they mail us a check and we deposit it, it takes more than 7 days to determine if that check is good. They have just put us in breach of contract with our clients as I cannot pay them for the items that they purchased. 3. It is getting to the point that we are considering sending out all our packages requiring adult signatures to receive them. We have had people claiming that they have not received their items when we have proof from USPS or UPS that items were delivered. We did our job in getting the package to the buyer. When they do a chargeback on their credit card, the merchant rarely wins as the credit card companies almost always side with the customer. In most cases I believe that this is out and out fraud on the part of the bidder as I am certain they do have the merchandise. 4. People who arbitrarily do a chargeback 2-3 months down the road for no reason. No phone calls or emails, nothing. We get a notice out of the blue that the purchase is being disputed. We try to contact the customer and they will not respond. And then they keep the merchandise. Again, the credit card companies tend to side with the card holders most of the time. When I have to drive to Georgia to retrieve $4800 worth of merchandise it gives me a lot of drive time to think of what I am going to say, and I get more P.O.’d every mile I drive. By the time I get there the Marine in me really comes to the surface. 5. Claiming that an item was broken, or fake and then sending us back a totally different item. We mark items such as glass, etc. with a hidden mark. We have a pretty good idea what we had as we handled it 15-20 times before we sent it out. This is out-and-out theft on the part of the bidder. I’m Eddie Caven with Key Date Coin Auctions. I have a few things to say about coin auctions and hope it benefits both auctioneers and bidders. Customer service is a top priority for auctioneers. Without customers, there would be no auctions (and hence, no service). In response to Proxiblog, Key Date Coin Auctions lowered its buyer’s premiums to 15%. For starters, the difference between a 15% and 18% premium is not that great. As pointed out in this blog, if you attract more bidders you will see more competition. Lower buyer premiums and starting bids are ways to spark a competitive auction. Part of that competitive atmosphere comes from auctioneers themselves. They should engage bidders onsite or online, in person or with audiovisuals, so that buyers are part of the auction experience. They should feel that sense of excitement, especially with a winning bid, knowing they came out on top. Check out Proxiblog’s “How Competitive are Your Auctions?” This is very informative. As for consignments, I had a gentleman email me recently stating that he was considering Key Date Coin Auctions. He couldn’t find a consignment form on my website to see my charges. I sent him the email response below. 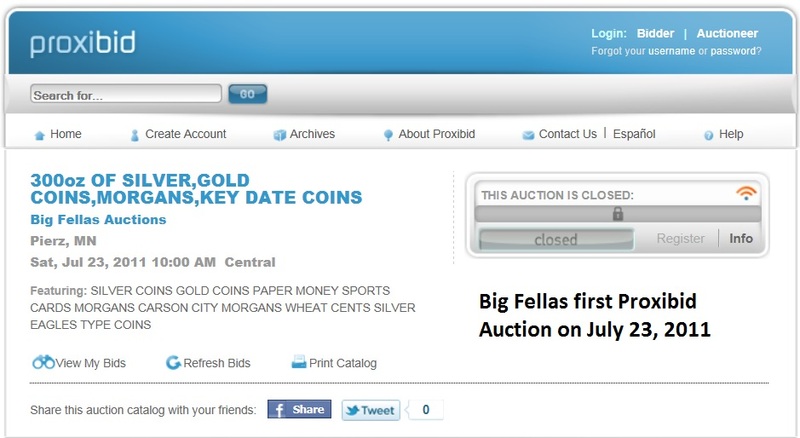 “Thank you for taking interest in Key Date Coin Auctions. I’m in the process of putting on a larger, higher-end coin auction in Oklahoma City. I charge between 5% and 10% for consignments. Everything depends on the items being auctioned and quality of those items. If I had more of an idea of what you wanted to auction, that would help. I don’t have to pay 20 employees like some other auction companies. I’m not out to make a killing off of other people’s items. Coins are the only thing I deal with as I am a coin collector myself. Every consignment is different. I do a lot of consignments on a hand shake. As an example, if you had 20 proof sets, and they sold for 5 dollars each, it would usually take 48 hours for bidders’ funds to clear my bank … at which time I would send you a check. If you had $5,000 dollars worth of items that sold in 10 lots, I would charge 5% or $250. I received that list today. His items may be on the block in a few weeks. This is a typical business transaction. If this were an elderly couple having to sell their collection to make ends meet, well, that’s another issue. Auctioneers can strike deals that they feel are right in their hearts. I guess that is why I find Proxiblog’s “Honor Roll Houses” to be a good thing. Auction companies on this list have the bidder’s best interest at heart. Most auctioneers know how the bidding process works. Bidders usually are looking for a few coins to add to their collection. Sometimes bidders are looking for items to resell. They all have one thing in mind, and that’s to get a good deal. But many bidders don’t know what it takes to get an item ready on Proxibid. We have to log that coin in to keep track of it, take pictures (not always as easy as it seems), describe the item, lot number, lot title, lot description, quality, and opening bid. And then transfer all the information to Proxibid. Once we get to this point, we still have several more hours to go. Now consider that 15% buyer’s premium, which includes a 3% credit card fee and 5% Proxibid fee. That leaves the auction house making 7% per item sold. You do the math. That’s not too much to ask for all the work. Then again, hosting an auction is somewhat like gambling. If we have a coin we bought for $40 and it sells for $35, that’s the chance we take: $35 + 7% =$37.45. We just spent $2.55 for bidders to enjoy the show. If the coin sold for $40 + 7%, that’s $42.80. So if that’s the case, we hope the bidder enjoyed the show and received a nice coin in return. In closing, auctioneers and bidders alike should subscribe to Proxiblog and read about all aspects of bidding, buying, selling, auctioning. Thank you, Proxiblog, for sharing your knowledge and advice! Note: Occasionally Proxiblog will post “On the Block,” allowing auctioneers to speak their minds about selling coins online. 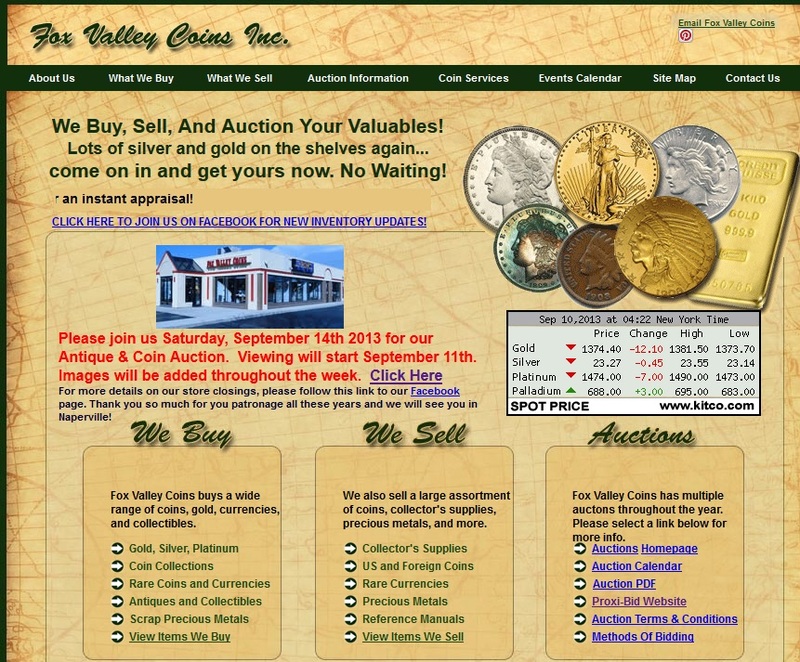 In this installment we feature Dave Nauert of Silvertowne Auctions, one of the highest ranked sellers of coins on this site (see our rankings to the right), giving numismatic advice to buyers, sellers and Proxibid auctioneers. 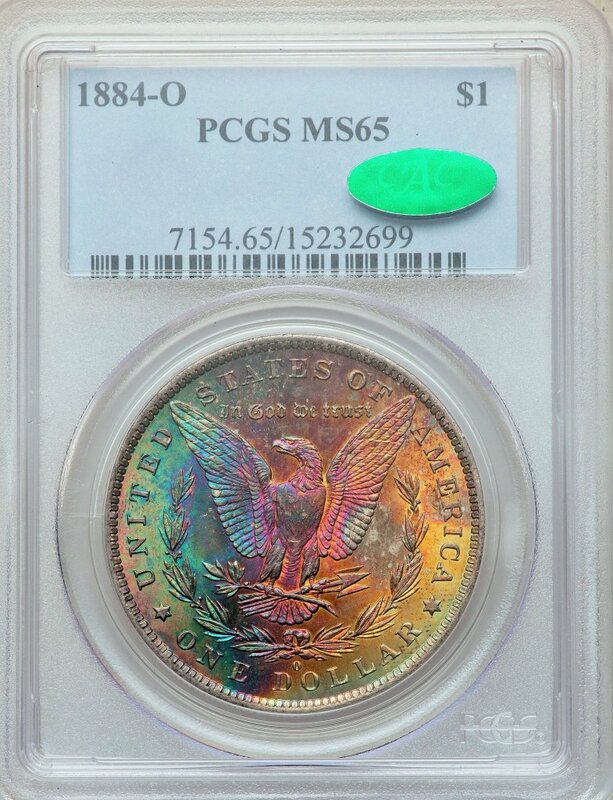 Buying coins in online auctions can be fun and exciting. A wide variety of coins usually is offered and often coins can be purchased for less than at other venues. There are, however, a few things to watch out for if you are a bidder or an auctioneer. Make sure the auction company has expertise in the merchandise it is selling. Many auctioneers will sell anything that comes through the door without having any knowledge of the product. This may be okay when buyers have the ability to physically inspect the items in person, but it puts buyers at a disadvantage on the Internet. The value of coins is so closely tied to the condition of the item that buyers must be able to trust grades given by the auctioneer, and also have good pictures to determine the grade. Without knowledgeable people, many auctioneers simply can’t supply this information and often will just rely on the consignor’s grades or not grade coins at all. Several auctioneers also can’t authenticate coins or detect cleaned, repaired, or doctored coins. Our coin experts at Silvertowne have been involved in the coin business for over 40 years. We look at and grade all of the uncertified coins ourselves. Problems are noted so that buyers can bid appropriately. Auctioneers and buyers also should be aware of unreliable grading services. I recently saw a coin in an MS-66 holder that was probably an MS-60 before someone started polishing it. (Note: This is called a “self-slabbed” coin, an unethical practice by unscrupulous sellers posing as grading companies–click here for more information about that.) By the time the “self-slabber” was done the coin it looked more like an AU-58. And then he consigned it. The difference in value between AU-58 and MS-66 is almost $8000. The person that bought the coin in an online auction thought he got a great deal. He didn’t. Buying, selling and auctioning coins can be fun. And remember, don’t be afraid to ask an auction company any questions you have about the coins in its auction. Most will be happy to help you out. How easy or difficult it is for an auctioneer to make the transition to Proxibid, especially when things go horribly wrong smack dab during an inaugural auction? You’ve heard us tout the quality of Proxibid Customer Service before. Jeremy Jager of Big Fellows Auction shares his first portal experience, putting our prior endorsements to the test. The Proxibid staff gives you as much help as you need. They make certain you are prepared for the event. Every step of the way–every question I had–those staffers were right there to answer for me. That meant a lot because, honestly, I was a little bit nervous about the whole online auction experience. I had bid on Proxibid before–many times, as a matter of fact; but here I was starting a brand new auction company run by a guy with modest computer skills. Perhaps you can understand how I might be apprehensive. Here’s the deal for those thinking about becoming a Proxibid auctioneer: If I can do it then pretty much any one can. For those contemplating selling coins on Proxibid, my advice would be to set aside time each day to practice the company’s auctioneer software. Also, check out other people’s auctions and their portal sites. In fact, I gained a lot knowledge from analyzing their sites, from photography to lot descriptions, and even talking to some of the other auctioneers. I was very surprised to find that everyone I had talked to was very friendly and helpful. Also, you should expect the unexpected. Right at the end of my first auction a construction crew accidentally took out the internet line, and my auction went down. I did not know what to do! But I did know that Proxibid promised its team would be there to help if anything like this should happen; but let’s face it, we have all heard promises before that were less then truthful. Within five minutes Proxibid support was on the phone with me. Customer service had one of their own people run the auction for me, and I called the bids over the phone. I can’t tell you how grateful I was to the young man who called and helped me get back up to finish my auction. Even most of the bidders stayed with the auction right through the end! I have to say from start to finish this was by far one of the best auction experiences I have ever had. The Proxibid sales team and Customer Service, the registered bidders, and cooperative auctioneers are the best group of people to work with anywhere. I am grateful that Proxibid stuck with me and my auction, especially when things got difficult. That’s the real test, and I give Proxibid an A+ for all it did. 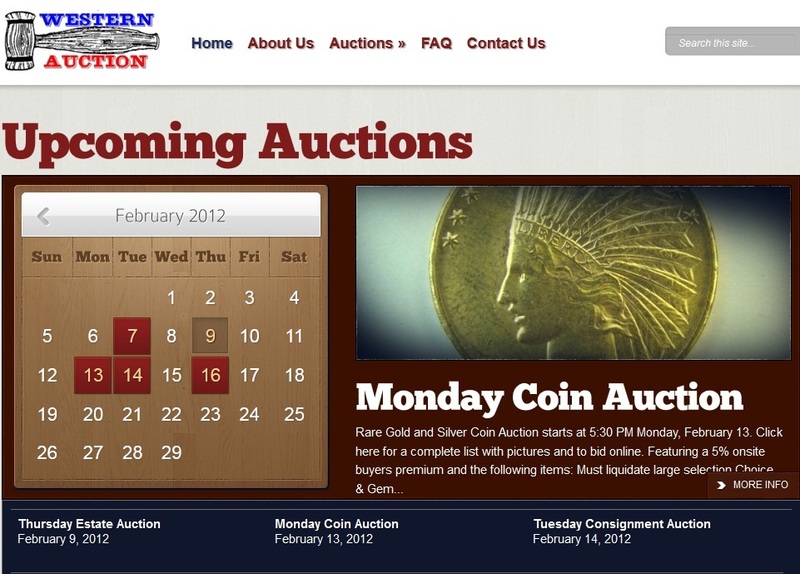 Good news today concerning an auction house appealing to the online coin buying audience. Bennett Auction Service has a philosophy based on “a balance of making a living and staying competitive,” says auctioneer-broker Adam Kielsmeier of the Prentice, WI, house. Part of that proper client-agent relationship is not viewing maximum bids online or allowing consignors to bid on their lots. Bennett Auction Service falls in line once again with our recommended best practices. Kielsmeier’s company focuses on “proper marketing, accurate representation, and fair terms for whatever we may be trusted to sell.” While he hasn’t specialized in coins, he is rethinking that market. We hope he does because these values are ones we have promoted in all our top houses. Western Auction has been in operation since 1983 and is fully licensed and bonded. We conduct consignment and estate auctions twice a week–each Tuesday and Thursday evening at 7 p.m. at our own facility. And we specialize in coins on the Proxibid portal. Since the inception of Proxiblog in May 2011, Western Auction has been ranked among the top houses selling coins on Proxibid. We have one of the lowest buyer’s fees on the portal, including best photography and numismatic consignments. We ship inexpensively and swiftly. We have APN clearance to make your bidding experience as secure as possible. Moreover, we do not see maximum bids or allow consignors to bid up lots. We stand for honesty and integrity. Those are our family’s core business values. Our family of auctioneers includes principal auctioneer David Zwonitzer, his father Mel Zwonitzer, Dave’s sons Daniel and Ty and Dave’s wife Kym. Together the family has over 80 years of combined experience. We invite you to visit our house online or in person and to check out our auctions listed on the Proxibid “Coins and Currency” page. 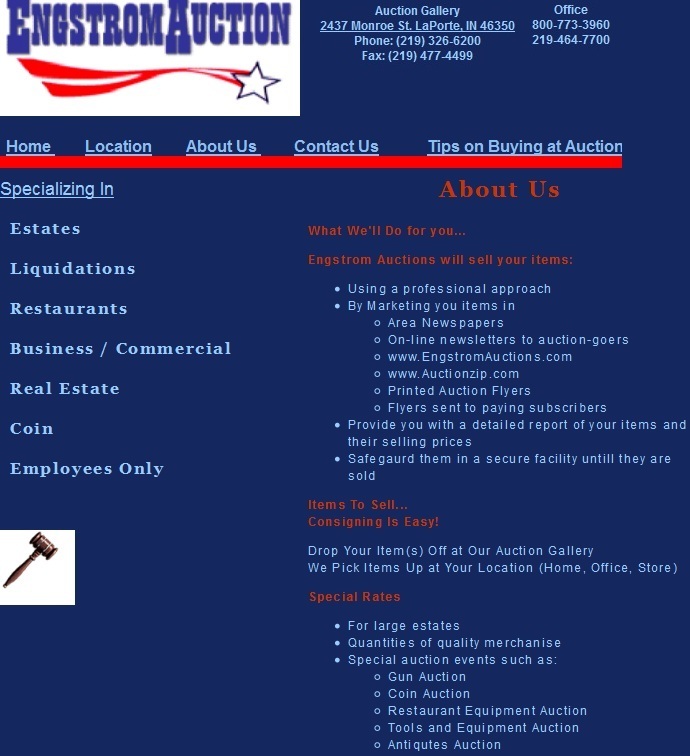 Leonard Auction, located in Addison, Ill., is a premiere Chicago auction house and estate liquidation firm that has won multiple awards on Proxiblog in such categories as photography, lot descriptions, consignments and overall best house. Leonard Auction also has detailed consignment policies that secure some of the best coin lots on the Proxibid portal. The company not only knows numismatics but also protects buyers, as this post illustrates, noting the Leonard policy on coin authenticity and emphasizing why Leonard Auction ranks among the most trusted on Proxibid. 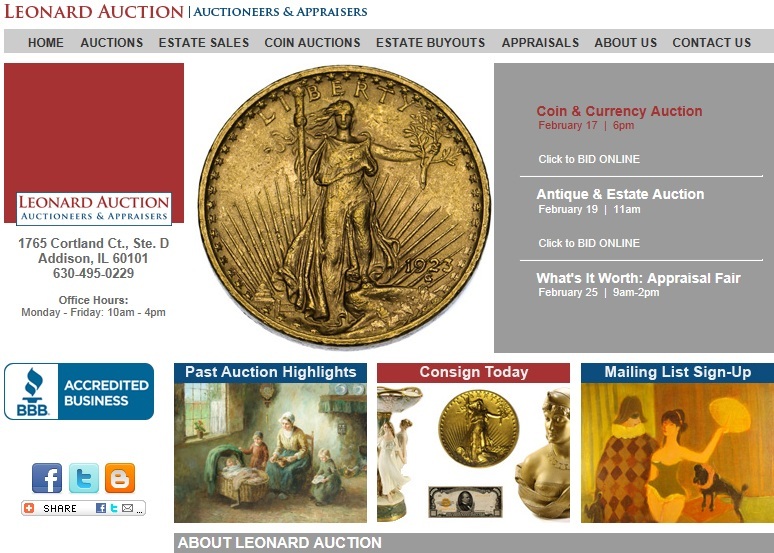 Leonard Auction’s onsite prowess combines with digital savvy to bring the excitement of an auction to coin buyers on Proxibid. The company conducts a series of auctions each month, generally on the third weekend. Its Friday night Coin & Currency auction features 300-400 lots of high-end collectible coins, currency, gold, silver, platinum and stamps. 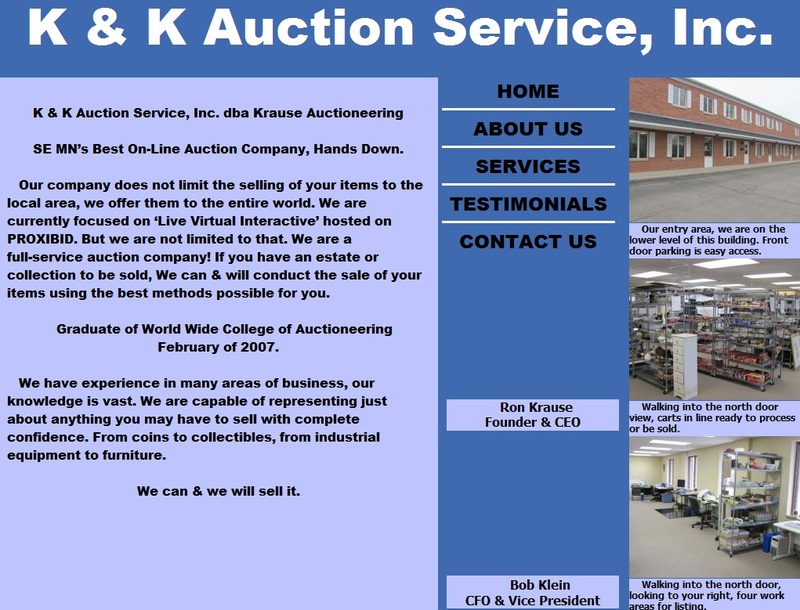 K & K Auction Service, doing business as Krause Auctioneering, is a full-service auction company specializing in online interactive auctions hosted on Proxibid. Ronald L. Krause’s company also has been at the forefront of best practices as reported by Proxiblog, currently in our top 10 best houses, with sharp photography and accurate lot descriptions. Krause Auctioneering is especially responsive to customer questions, with low buyer’s fees and quick, inexpensive shipping. Onsite and Virtual Auctions, generating competition in the auctioneer tradition and selling through consignments on a regular basis because of that competition. Timed Online Auctions, displaying consignments worldwide through cutting-edge visual photography and accurate lot descriptions. Onsite Estate and Business Liquidation Auctions, drawing bidders from local and area neighborhoods and generating additional interest from online bidders experiencing the action via Proxibid technology. Krause Auctioneering excels in customer service, especially important for benefit and fund-raising auctions. Consignors always get a free consultation, and packing and pickup services also are available. Contact Ron Krause today at ron@krauseauctioneering.com for more information and personalized service! We thank Krause Auctioneering for sponsoring Proxiblog’s scholarship fund to help ease student debt and create the next generation of auction-house bidders! Welcome to James Peterson Company! 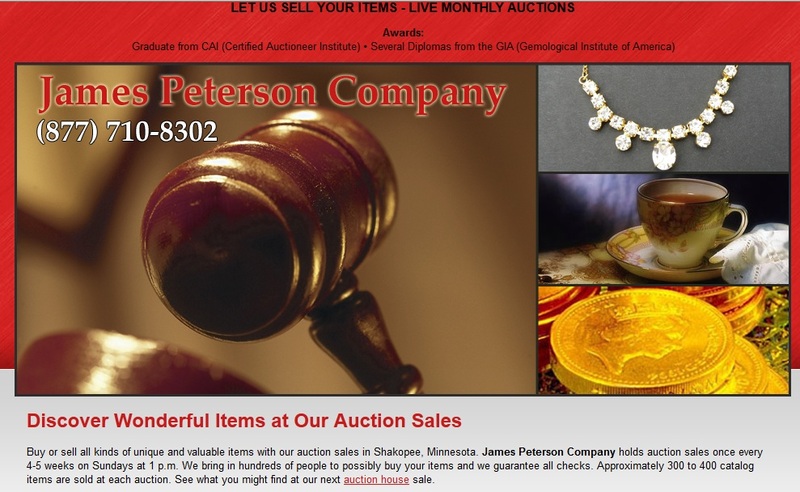 James Peterson Company is one of the most experienced onsite and online houses in the upper Midwest, featuring regular sales every 4-5 weeks on a variety of high-end collectibles, including coins. Auctioneer Jim Peterson has more than 41 years experience and attracts some of the best coin consignments on the Proxibid portal. Last year one of his precious metal lots was featured in Coin World. You can read about Peterson’s prowess in attracting top-level coins by clicking here. James Peterson Company is a full-service house that can arrange to sort, clean, and pick up items to bring to his onsite auction house for sale. All consignments are done via contract to protect the seller. Potential consignors who contact the house with a list of items to sell are given quick, no-obligation appraisals. Moreover, the company takes care of all promotion, including email blasts, online advertising, direct mailers and local newspaper advertising. Consignors can sell one or hundreds of items, with sales settled in 20 working days. James Peterson Company is especially expert in all manner of collectible glass and china; dolls and furniture; men’s and women’s jewelry and timepieces; and, of course, rare coins, tokens, bullion and other numismatic items. For more information, or to contact the company, click here. We thank James Peterson Company for sponsoring Proxiblog’s scholarship fund to help ease student debt and create the next generation of auction-house bidders! 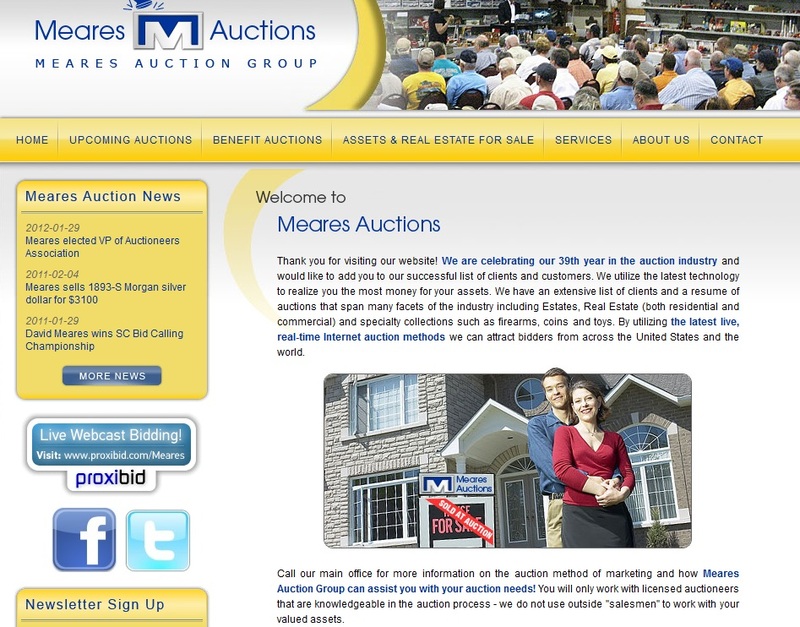 a leading auction company located in Stephens City, Va.,, has been top-ranked on Proxiblog since our site’s inception. Owner Scott Strosnider was among the first Proxibid auctioneers to take advantage of US flat rate shipping, sending winning lots inexpensively, quickly and safely for little more than $10. Scott Strosnider is known in the auctioneering business as one of the most generous sharers of best practices, especially on Internet. 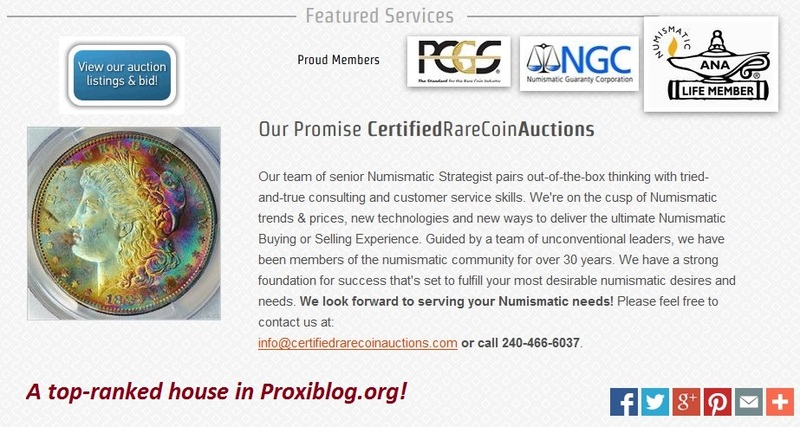 Proxiblog knows at least a half dozen coin auctioneers who have consulted with him on best practices. He is known for traveling across the country as a PRI Certified Independent Ringman, working auctions for newcomers to the business needing hands-on training in the competitive auctioneering tradition. Proxibid coin buyers should check out his online only and onsite/Internet auctions with no reserves and high quality lots. For those wishing to secure his services, for auctions or consultations, contact Scott Strosnider @ SCOTT AUCTIONS (540)877-7182. 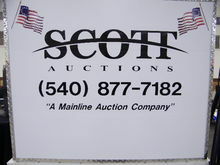 We thank Scott Auctions for sponsoring Proxiblog’s scholarship fund to help ease student debt and create the next generation of auction-house bidders! If you are an auctioneer calling coin sessions, or a collector who has registered on Proxibid, you will want to check out Coin Update. The site shares a wealth of information about the hobby by top numismatic writers. Better yet, it is free, Internet-based (like Proxibid) and provides yet another venue for you to reach an online viewership that purchases coins. When you read a newsstand coin magazine, you are fire-walled by paper. When you visit Coin Update, you become part of a vast assortment of dedicated coin sites, hobbyist blogs and even mainstream media. Better still, you will become more familiar with your consignments. Our updates inform you about news alerts such as counterfeit coins or the latest bullion prices and trends for gold, silver, platinum or palladium. You’ll better understand your online clientele—their likes, dislikes, and desires—because our news coverage is aimed at the collector and Internet coin buyer. Several Proxibid coin auctions each week list hundreds of lots of by the U.S. and world mints. You’ll learn more about your consignments because our writers focus on coin grading, classic coin series, and modern coin products. Finally, you can interact with us through free online subscriptions, social media and comments, which we welcome. For a free subscription by email or RSS, please visit this URL: http://coinupdate.com/subscribe-to-coin-update. We thank Coin Update for sponsoring Proxiblog’s scholarship fund to help ease student debt and create the next generation of auction-house bidders! Engstrom Auction is one of the most innovative houses on Proxibid. The company solicits customer feedback, features accurate lot descriptions and provides some of the best numismatic photography on the portal. Engstrom Auction, committed to continuous improvement, always showcases something new and exciting in its Proxibid sessions. Processing of credit cards within 24 hours after an auction and shipping the next day, a wonderful courtesy to bidders eager to inspect their winning lots. A commitment to ever sharper and expandable photographs, so that bidders can have a good idea about condition, luster and variety. Use of streaming video to convey the excitement of an auction to online bidders, with customers asked for feedback on the best camera angles to view lots. These are just a few of the innovations that Engstrom is making, and we’re bound to see more. This is a chief reason why Engstrom Auctions has consistently been a top-rated house on Proxiblog, currently 4th in a very competitive field of auctioneers who also are numismatists. You can see how helpful Engstrom Auction is to bidders and sellers alike by viewing articles on its home page. This article shares tips on buying at an auction. This article shares tips on selling at an auction. For more information, visit Engstrom Auctions online or view this page for contact data. We thank Engstrom Auctions for sponsoring Proxiblog’s scholarship fund to help ease student debt and create the next generation of auction-house bidders! Click Coins is one of the most convenient sites on the Web for coin enthusiasts and auctioneers eager to learn the latest about the industry. 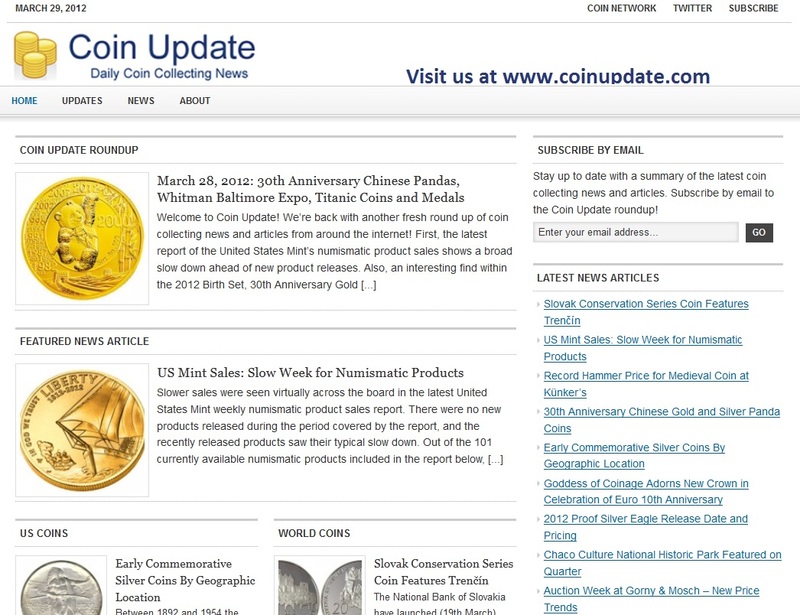 The site contains dozens of links to articles, photos and multimedia by Coin Update News, Mint News, Coin Week, Numismatic News, Coin World, World Mint News, Perth Mint, Royal Mint, Stacks and Bowers–and even Proxiblog! 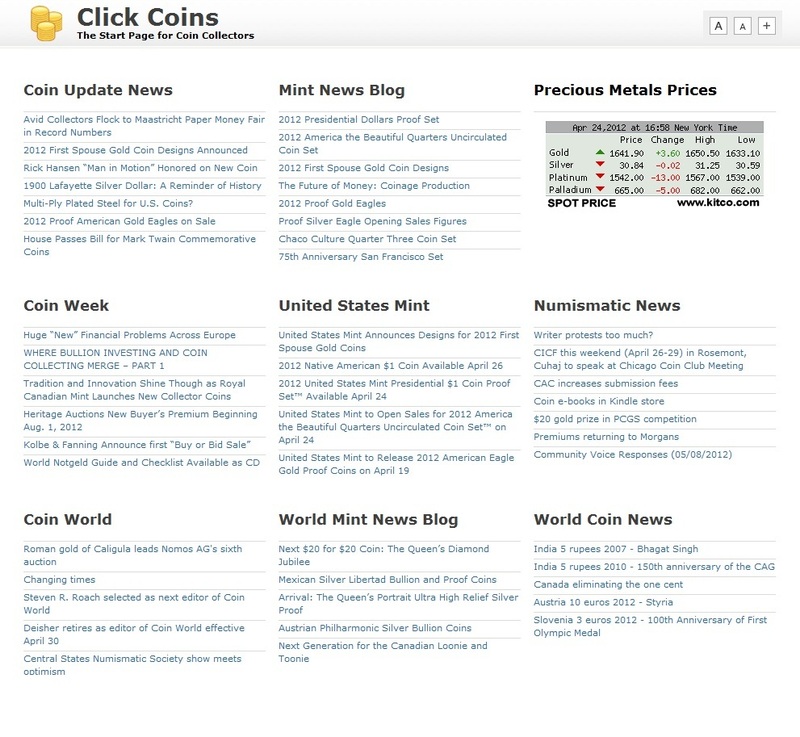 Although the Internet has plenty of coin-related sites and blogs, Click Coins lists the articles and posts you need in one cleanly designed package. Why not make Click Coins your business or personal home page so that you can tap into the best posts from the top sources from smart phone, iPad, laptop or desktop? Your numismatic knowledge base is just one click away. 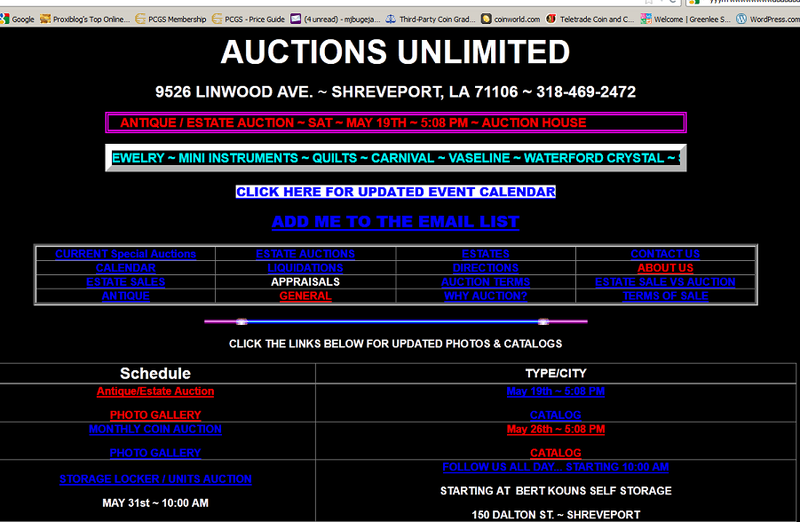 Auctions Unlimited of Shreveport, LA, is a full-time family-owned operation with complete auctioneering services. Proxiblog has praised Auctions Unlimited as a trusted site with a low Internet buyer’s fee, regular coin consignments and good lot descriptions. While Debra Johnson, auctioneer, acknowledges that she is not highly experienced in the coin world, she does have excellent consignors that guarantee all of their coins and accepts returns on any coin that is not as described. In addition, Debra provides super fast shipping. Normally the coins are packed up on the Monday following the Saturday night auction and shipped out on Tuesday. Debra is a graduate of the Missouri Auction School and has advanced this innovative house on the values of honest, reputable service. Debra is avid about continuing education in the auctioneering business and so has made a successful transition to the Internet, respecting both onsite and online bidders. She works hard for her consignors but also ensures that the consignments are top-quality, especially when it comes to coins. She relies on return bidders and so does her best to make each session fun and exciting. A key to the success of Auctions Unlimited not only includes values and business savvy, but also the manner in which Debra and her staff treat clients and customers. She believes in interpersonal communication, which includes willingness to meet with potential consignors in person or talk with them on the phone. Debra also uses her communication skills to advertise auctions via local and digital platforms. Debra’s staff not only works hard for clients and bidders but also takes pride in photography. Visit her photo gallery for samples or drop her an email at ladyauctioneer@comcast.net. Welcome to Matthew Bullock Auctioneers! Matthew Bullock Auctioneers, specializes in high-quality coins, especially Morgan dollars, with some of the finest digital photography on Proxibid. Lot descriptions are based on numismatic knowledge, and owner Matthew Bullock and staff provide outstanding customer service, to bidder and consignor alike. In addition to coins, the auction house often lists in quarterly Proxibid sessions a broad range of items, including fine jewelry, firearms, vintage postcards and photographs, advertising memorabilia, and military collectibles. Auctioneer Matthew Bullock is a second generation antique dealer with over 15 years’ experience buying selling and appraising antiques. He opened his first antique shop in Sandwich, Ill., at age of 23. He has owned and operated Main Street Antiques in Ottawa, IL since 2006. Matthew is a member of the Illinois Auctioneers Association and National Auctioneer Association. One of Matthew Bullock’s specialties is the amount of pre-auction advertising done before the first bid is called. His company has a marketing department that vigorously promotes auctions utilizing direct mail, emails, internet websites, collector clubs and illustrated ads in antique and other publications and venues. Because of that, Matthew Bullock Auctioneers often attracts some of the best coin consignments on the portal. Many are located at estate auctions rather than through coin dealer consignments, ensuring quality coin lots. Better still, the company’s shipping department mails winning lots inexpensively and quickly. If you are interested in learning more about Matthew Bullock Auctions, please contact the company by clicking here. Check out Kaufman’s upcoming coin auction slated Tuesday, July 3, on Proxibid. 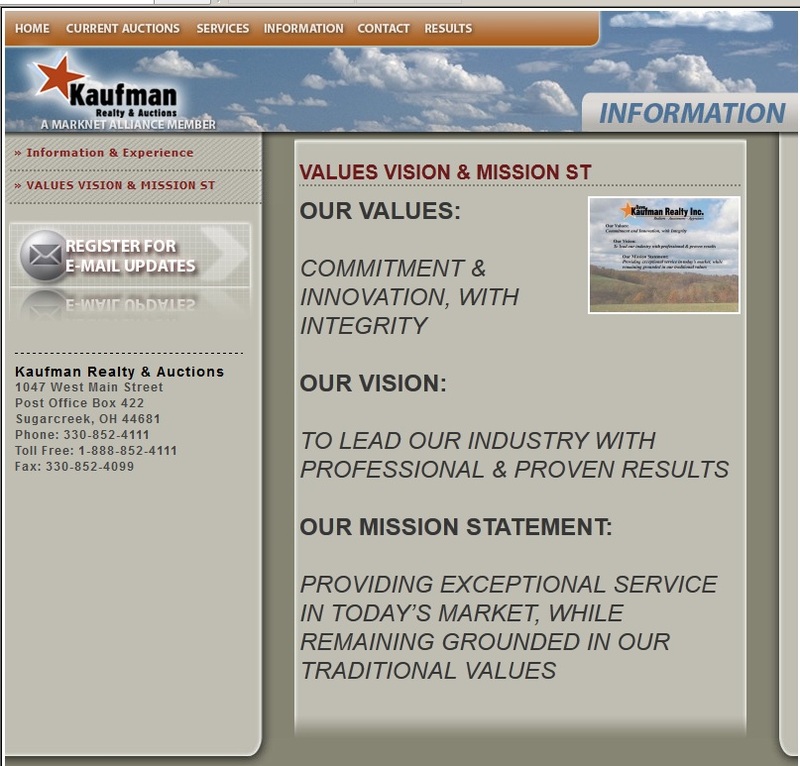 Kaufman Auction, located in Sugarcreek, Ohio, has a reputation for superior service and numismatic knowledge. We applaud the company’s values, which include commitment to consignors and bidders, innovation within the industry, and above all, integrity in all transactions. Its mission statement promises exceptional service guided by and grounded in these traditional values. Proxiblog regularly attends Kaufman’s coin auctions because of the quality of consignments, the low buyer’s fee, and numismatic integrity. The company was founded in 1971 and has grown to become a major auction and realty house in the competitive Ohio market and Midwest, with extended reach nationally and internationally via the Proxibid portal. This record of growth and achievement is due to the trust that consignors place in Kaufman Auctions, which conducts upward of 275 to 300 auctions across categories, from real estate to coins, each year. Click this link to meet and contact the staff of this premiere auction house known for superior customer service. Check out Capitol Coin Auction’s upcoming coin auction slated Sunday, July 29, on Proxibid. 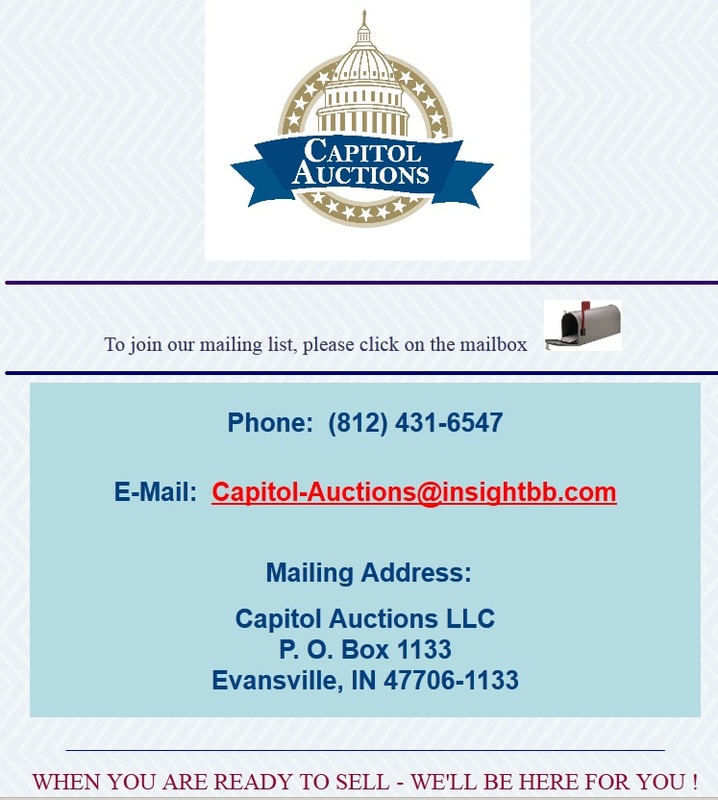 Capitol Auctions, located in Evansville, Indiana, specializes in coin auctions. The company has more than 35 years’ experience in collecting, investing, and grading rare coins. Moreover, Capitol has numismatic quality photographs and accurate lot descriptions so that seller and bidder are informed transparently about value. Because Capitol relies in part on estate consignments, each Proxibid auction is an event, with top-quality silver and gold coins open for bidding. Proxiblog has won lots from Capitol for the past two years, and its service is quick and professional. Nonetheless, bidding is always keen because of the desirability of the lots as well as the legwork that the company does for consignors, ensuring an audience and adding to the excitement online or onsite. In addition to sharp photos and concise lot descriptions, Capitol publishes a catalog showcasing coins and informs bidders via an extensive mailing list. For large consignments, Capitol advertises in national periodicals like Coin World and Numismatic News. GWS Auctions, one of Proxiblog’s Honor Roll houses, specializes in part in coin consignments, especially Morgan Silver Dollars, Peace Dollars and all 90% silver and gold US coins. Auctioneer and owner Brigitte Kruse is especially proud of her company’s coin auctions on Proxibid. She consider herself and employees as “coin rescuers” who do not want U.S. and World history and art–coins embody both–melted and lost to future generations. We are incredibly impressed with her respect for collectors and investors. 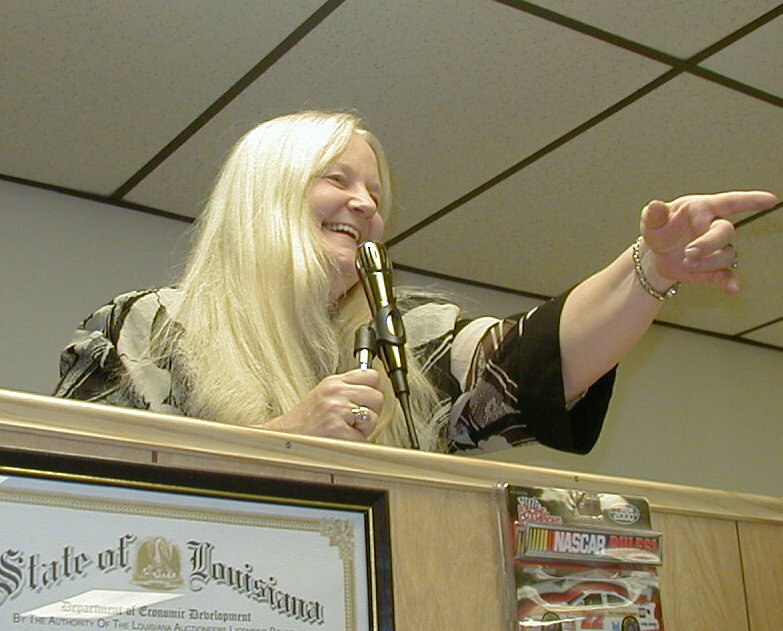 Brigitte, in fact, is a numismatist as well as auctioneer and takes pride in her company’s lot descriptions. 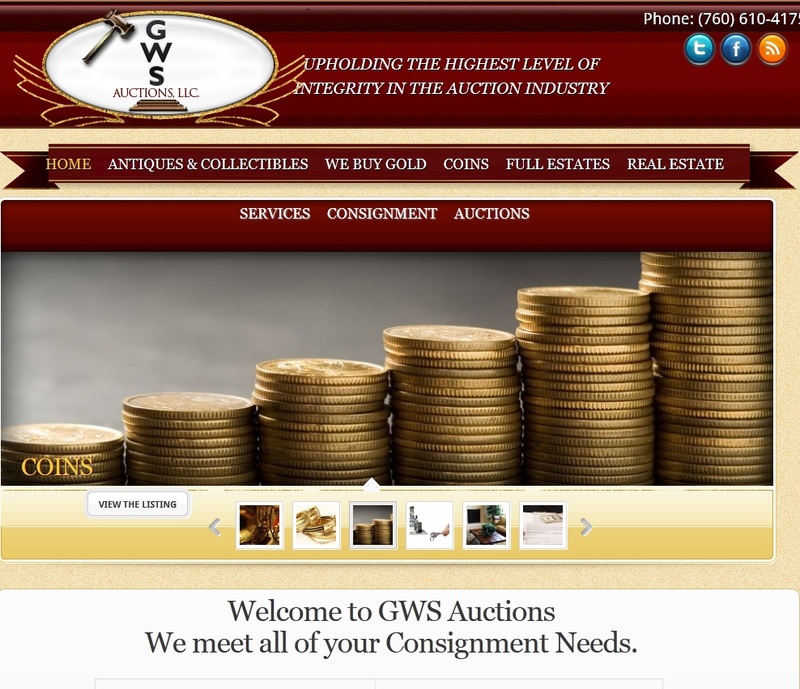 GWS Auctions, located in Palm Desert, California, has gone worldwide on Proxibid and Internet about its reputation for honesty and integrity. The key to her success is respect for consignor and bidder. See for yourself! Why not view or bid in GWS’s next auction, scheduled Saturday, June 16, at noon Pacific. 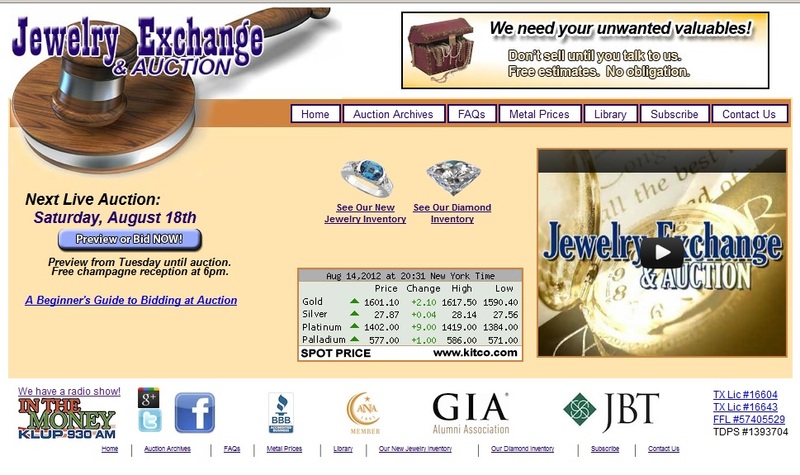 Jewelry Exchange is conducting an auction featuring coins on Saturday, Aug. 18. Check out the catalog by clicking here. Jewelry Exchange, located in San Antonio, Texas, is a clearinghouse for all valuables, especially coins, currency, stamps, sterling, and jewelry, along with other auction items, such as antiques and firearms. The company trades gold, silver and platinum bullion in all forms and specializes in estate diamonds of all cuts, carats and clarity. The company’s Saturday evening auctions are held in its Stone Oak gallery with an international simulcast over Proxibid.com. Proxiblog has been a long-time customer of Jewelry Exchange and can attest to the company’s quick shipping, 15% buyer’s fee and customer service. Jewelry Exchange is a member of the Better Business Bureau, the San Antonio Chamber of Commerce, and the American Numismatic Association. Auctioneers Adam and David Bluestein also are co-hosts of “In the Money,” a hit radio program that answers such questions as “What is it? What’s it worth? And, what do I DO with it?” Adam and David take questions on the air, too, every Saturday morning at 7 a.m. on San Antonio’s KLUP 930AM. Welcome to Rolling M. Auctions! Proxiblog has been patronizing Rolling M Auctions for the past two years because of head auctioneer Mark Murphy’s numismatic knowledge, customer service and great consignments. 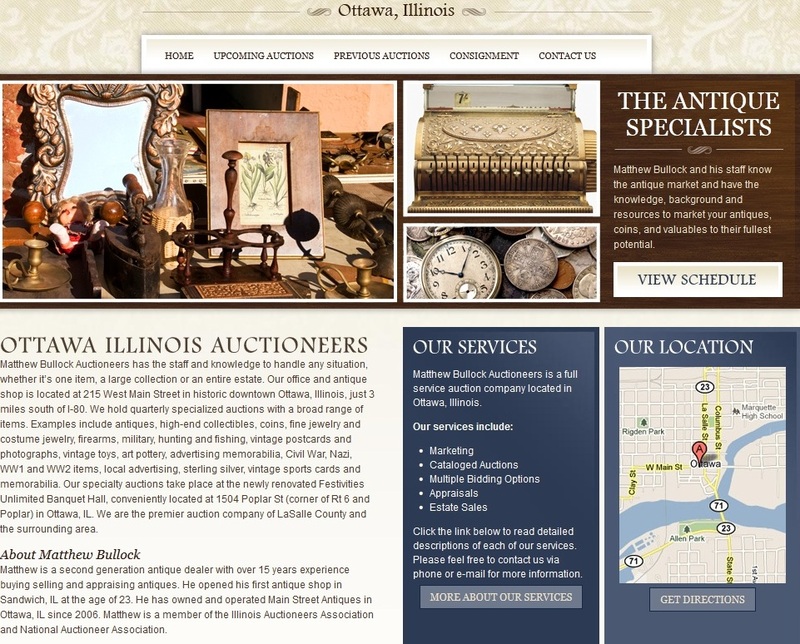 The company advertises each onsite and online auction with email blasts, Internet marketing, online classified notices and print catalogs sent to bidders across the country. Rolling M Auctions specializes in making onsite and online sessions exciting, fostering competitive bidding for sellers and cherry-picked bargains for bidders. 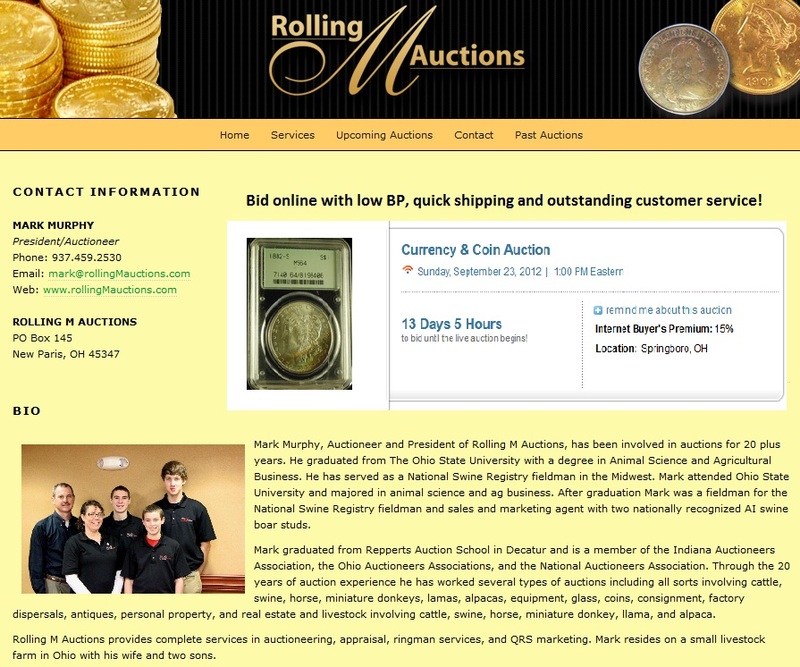 Rolling M Auctions also provides professional ringman services with experience in bid spotting as well as working as the extension between auctioneer and bidding crowd. The company also has expert appraisal services. Why not call today … or check out his latest Proxibid auction by clicking here. Proxiblog thanks Mark Murphy and Rolling M Auctions for sponsoring this week’s Proxiblog and for donating to our scholarship fund. If you would like to sponsor a week’s worth of Proxiblog with a small or large donation–from $25 and up–than contact Michael Bugeja at mjbugeja@yahoo.com. Certified Rare Coin Auctions has one of the strongest numismatic ethics in the business, creating a brand known for trust, integrity and expertise. While other Proxibid auctioneers struggle with shipping, using third-party companies or ridiculous formulas, Auctioneer Shane Jennings ships his coins for free. But that is only one aspect of Certified Rare Coin Auctions’ exemplary service. 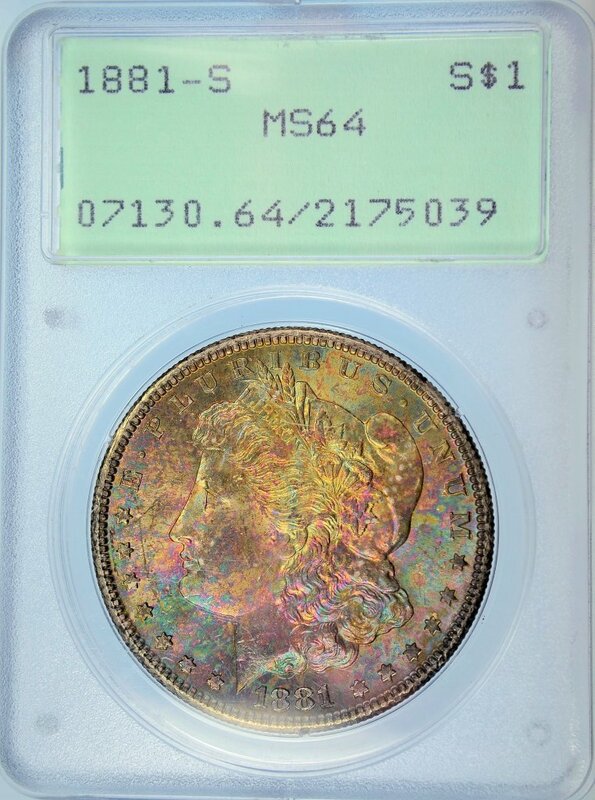 Certified Rare Coin Auctions has a select inventory of some of the most beautiful coins ever produced by the U.S. Mint, especially Morgans, with so-called “monster toning.” Of all metals used in coinage, silver is the most reactive to environment, especially when mixed with 10% copper, the common alloy in most American coinage. Advanced collectors especially pay high premiums for monster toning because it tells the journey of the metal–where it was mined (i.e. Comstock Lode discovered in 1859), where it was minted (Philadelphia, San Francisco, Carson City, New Orleans, etc. ), where it traveled (provenance: history of ownership). Then there is the natural beauty of decades or centuries of toning with spectacular colors that blend seamlessly from one hue to another or form unique snowflake patterns that qualify as metallurgic art. When combined with a high grade, coins like the one below–offered in a recent Certified auction–gain in value far beyond normal premiums, validating each masterpiece as an investment in beauty. Certified Rare Coin Auctions features some of the finest numismatic photography on the portal. You not only get a sharp photo of the slabbed obverse and reverse of the coin, but also expanded views so that condition and tone can be verified. As its name suggests, Certified Rare Coin Auctions offers coins from the top holdering companies (PCGS, NGC, ANACS, ICG). We encourage you to bid in Certified Rare Coin Auctions through Proxibid. You will never find a hidden reserve. You’ll benefit by reading the company’s lot descriptions. The company has a low buyer’s premium of 15% and a generous 5% cash discount for invoices totalling $3,500 or more. For more information, contact the company by clicking here. We thank Shane Jennings and Certified Rare Coin Auctions for sponsoring Proxiblog’s scholarship fund to help ease student debt and create the next generation of auction-house bidders!